We thought that since it's July you guys might want a new pair of shades. The prize for this caption contest is going to be a brand new pair of our Vipertail Ballistic Sunglasses. You can check out the Vipertail details here. Only one entry per person and we'll accept all entries posted until 12:00 p.m. EST on Wednesday July 20, 2011. Go. Magpul International presents; The Art of The Tactical Deckchair. Just because war is hell, doesn't mean you have to be uncomfortable. Presenting, the new magpul tactical chair. The chair is slinged to you at a angle so you can still knee down, lay down and when the battles get long, sit down. Taking his online gaming skills to the airsoft field... that's right! hes a Camper! Da-Vinci realised that if he was only going to use bb's to carve his latest masterpiece, he may as well take a seat....this could take a looooong time! 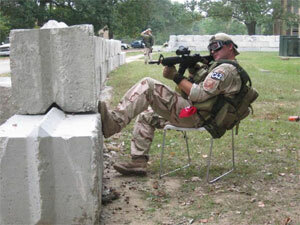 Chairs: Helping airsofters walk up walls since 2011. "He came, he sat, he conquered"
Location:In your house .. behing you ... BOOOO! "Got the chair, got the attitude, just missing the Revision shades ...."
Thanks everyone for taking the time to come by our thread and posting up a caption. There were a lot of great captions that we thought were hilarious. "Just because war is hell, doesn't mean you have to be uncomfortable." -Angel-, congrats and be on the lookout for a private message from us with details on how to receive your prize. 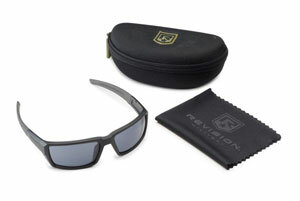 If you're still interested in getting a pair of Revision eyewear, visit our online store, but don't forget to use the exclusive Arnies Airsoft discount. Just enter the code "ARNIE" into the discount code field during checkout and you'll receive 30% off your order. Thanks to everyone who entered the contest. We hope that you'll keep checking out the Revision threads for more contests, giveaways, and news. Thanks Revision for another great contest and prize! Hopefully they arrive for my holidays and I can strut around Barcelona in ballistically rated style .